Where do you want to be when the clock strikes midnight on New Year's Eve? For hundreds of thousands of people in Las Vegas, it's all about freezing their asses off while waiting for fireworks to erupt from the rooftops of seven Strip casinos. Fortunately, there will be plenty of booze to keep you warm. So find a date, layer up in layers of gore-tex, and figure out which of the following New Year's Eve parties has your name on it. One ticket. Two parties. Chateau nightclub and Beer Park are giving revelers the chance to go wild in both places. Here's the good news -- each one has a rooftop vantage point to truly soak in the fireworks. Even better news -- there's a premium open bar. If you've got some extra cash lying around upgrade to a VIP bottle service package, beginning at $500 for Beer Park and $750 for Chateau. The biggest New Year's Eve celebration in Downtown Vegas is at the Fremont Street Experience, surrounded by classic casinos and bright neon marquees. "America's Party Downtown" features 12 bands on four stages, beginning at 6pm, and includes a live broadcast of the Times Square ball drop on the massive Viva Vision overhead video canopy. If big explosions are more your thing, head to the far west end of Fremont Street, where The Plaza will have a number of parties and the only downtown fireworks show at midnight -- plus parties throughout the hotel and all-you-can-drink well and drafts on the casino floor (wristband is $60, but just $49 if you order in advance). Need even more downtown fun? Joey Lawrence is hosting a 90s-themed house party at the Downtown Grand, beginning at 8pm on the Grand Casino floor with a pregame dance party at the Art Bar at 5pm. The New York-New York resort is throwing an outdoor party by its Brooklyn Bridge replica and Nine Fine Irishmen pub. The celebration runs 8pm-midnight and includes an open bar and DJ. It's a great spot for watching the firework explode overhead. 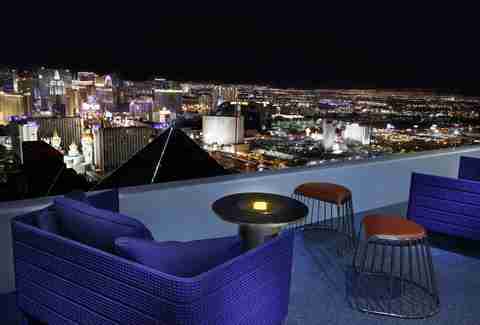 Check out some of the new renovations at the Stratosphere while partying for NYE. 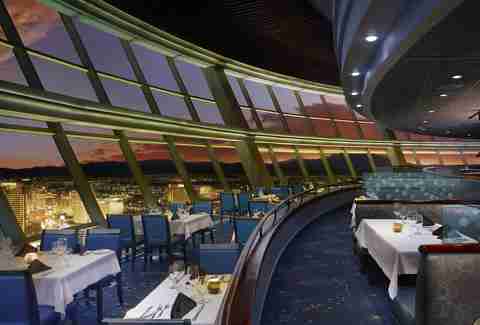 The Top of the World restaurant, with crazy views from the 106th floor, will take reservations for fireworks seating beginning at 10pm, with a $299 prix-fixe menu, glass of Champagne, cash bar, and party favors. You can also celebrate at the 107 Skylounge on the 107th floor ($199, 10pm-4am, with two-hour open bar, DJ, party favors) or the observation deck on the 108th floor ($250, 9:30pm-12:30am, including three hour premium open bar, martini luges, food stations, Champagne toast, DJ, and go-go dancers). Did we mention fireworks will be shooting off the side of the 1,149-foot-tall tower? You already know the Boulevard Pool ice rink is one of the coolest things you can do in Vegas this winter. So pay a visit for New Year's Eve, where the party runs 7pm-1am and guests can indulge in up-close views of the fireworks. Tickets include an open bar for the adults, skate rentals, and live DJ. One of the few Strip parties in which parents don't have to leave the kids at home. Ri Ri Irish Pub operates on Ireland time, especially on New Year's Eve. The bar will make the first toast to 2019 at 4pm -- or when it turns midnight in Ireland. A special menu will be served throughout the evening, including the Black Velvet cocktail, which mixes Guinness and Champagne for $7.75. (Hey… you try it.) The Black Donnellys will play live at 8:45pm and yes, another toast will take at the actual stroke of midnight in Vegas. 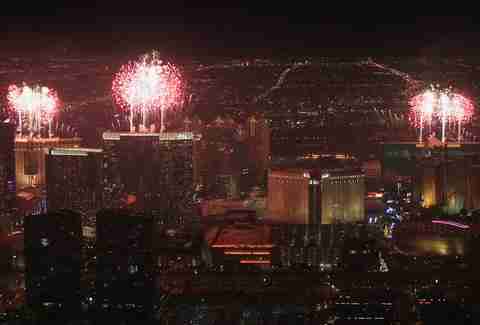 Sundance is the only helicopter tour service to fly over Las Vegas on New Year's Eve. Passengers will take flight and journey just west of the Strip, where they can catch the fireworks from a sky-high vantage point. The ride lasts about 30 minutes and you'll be handed a glass of champagne and some passed hors d'oeuvres after landing. Chef Patrick Munster is serving up a special prix-fixe menu that includes grilled Alaskan crab legs, winter risotto, Snake River American Wagyu strip, and petit fours (a fancy term for small pastries). If you happen to be around at midnight, a champagne toast is included. 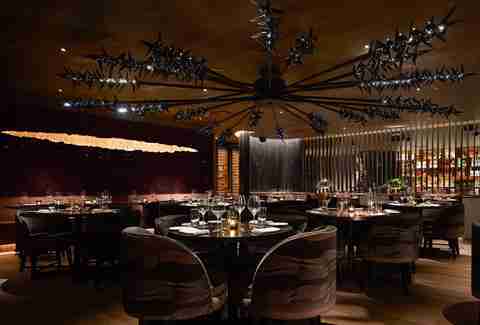 STK has a special four-course meal with seatings at 4pm or 8pm. Guests will be offered Australian Wagyu Strip steak, filet and crab legs, Chilean sea bass, or mushroom risotto as the main course. The second seating includes a glass of Veuve Clicquot to kick things off. 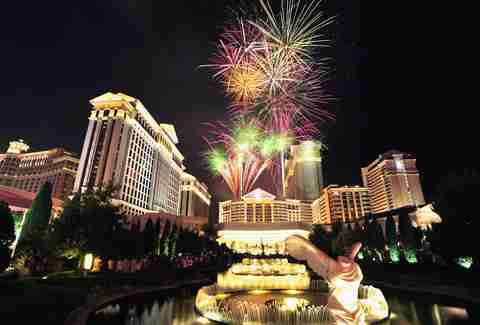 Need a perfect spot to scope out the fireworks from the Strip? The Spanish Steps at Caesars Palace has all-you-can-drink deals ($124 per person) plus VIP packages with seating areas included (beginning at $200). If you prefer to stay indoors, Montecristo Cigar Bar has a Roaring 20s-style Great Gatsby party (beginning at $61). Meanwhile, Absinthe will have a special performance 9:30-11pm with a glass of Champagne included, followed by a courtyard celebration with open bar and small bites (tickets start at $299). Nearly every restaurant at the resort will have special menus, but Gordon Ramsay Hell's Kitchen (Gala Menu 9-11pm, $400 plus $525-575 optional wine pairings) and Restaurant Guy Savoy (Prestige Menu, 7:30-10pm, $550) have the best Strip views. One of our favorite bars in Vegas, the Golden Tiki is throwing a "no-cover" New Year's Eve party, although a two drink minimum is required for a table reservation. Mark Rebillet will perform live at 11pm and you gotta watch this video to get an idea of what he's all about. Giordano's has a killer view of the Strip from the Grand Bazaar Shops, so why not make a pizza party out of it? Enjoy a three-hour drink package, passed appetizers, party favors, and a champagne toast at midnight. There will also be a dinner buffet. We're pretty sure it's gonna include some deep dish pizza. This past year saw a lot of changes, including the transformation of the Mandarin Oriental into the Waldorf Astoria. 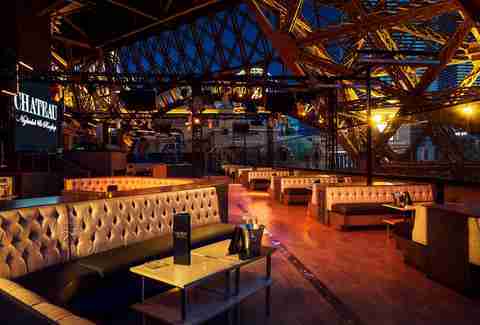 The newly renamed property celebrates New Year's Eve with Bubbles & Bliss at Skybar. Tables include one half bottle of liquor or one bottle of wine for every two guests. The views through floor-to-ceiling windows from the 23rd floor are perfect for checking out the NYE action on the Strip below. Unfortunately, 2018 was a year we lost Joël Robuchon. Pay tribute to the late chef and his legacy with an incredible seven-course tasting menu at L'Atelier de Joel Robuchon by Executive Chef Jimmy Lisnard. 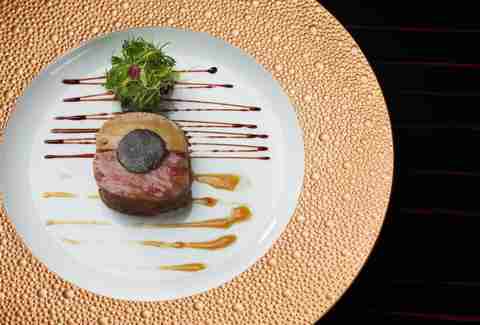 The meal is served 5-10pm, crafted with ingredients ranging from shaved truffles and Ossetra caviar to Kagoshima Wagyu and seared foie gras. The dishes are complemented by Champagne and wine pairings. 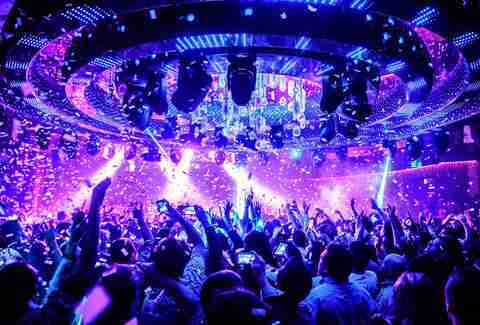 It's a New Year's Eve tradition in Vegas to have some of the biggest names in music take the stage at venues up and down the Strip. This year you've got hometown boys Imagine Dragons at the Chelsea inside the Cosmopolitan, Bruno Mars taking a break from his on-again, off-again Park MGM residency to play T-Mobile Arena, Lady Gaga fresh into her new residency at the Park MGM, Maroon 5 continuing their annual NYE run at Mandalay Bay, Gwen Stefani and her ongoing residency at the Zappos Theater inside Planet Hollywood, and Tenacious D at The Joint inside the Hard Rock. The recently renovated Thunderbird is a vintage motel that has two affordable options for celebrating New Year's Eve in retro style. The Atomic Ball is a free party in the Thunderbird Lounge with a DJ, dance lessons, and a rockabilly theme. For something more formal, check out the Black & Gold NYE Party inside the Royal Showroom, featuring a balloon drop, photo booth, optional bottle service, and more. In addition to the regular 5-7pm happy hour, all PT's Taverns will be running an extended happy hour on New Year's Eve from 9pm to 5am. (That's eight hours for those of you without a calculator.) You get half-off drinks: wine by the glass, premium spirits, and all craft or imported beer. Food deals include $6 Sriracha chicken bites, $8 flatbreads, and tons more. Throw in noisemakers, hats, and a Champagne toast at midnight, and you've got a party any local will love. 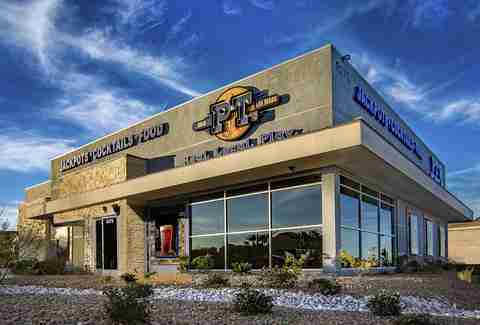 The deal is good at 60 locations in the Las Vegas Valley: PT's Pub, PT's Gold, PT's Ranch, PT's Brewing Company, Sean Patrick's, Sierra Gold, and SG Bar. Bounce between three bars -- The Dorsey, Rosina, and Electra -- while just paying admission once. You also get passed appetizers 9-11pm, reserved seating at your original bar, and complimentary champagne at Rosina 9-11pm. We're especially excited about a one-night-only "NYE Cocktail" with rum or tequila. And here's a bonus to get over that nasty New Year's Eve hangover: Return the next day wearing your wristband and receive a free drink. Don't let 2018 go by without checking out the new version of Spago at the Bellagio. The lakeside restaurant already has fountain views, but will also have great sightlines for the fireworks on NYE, especially from the patio. So make a reservation asap. The special seven-course "New Year's Eve Gala Dinner" at 9pm includes Japanese A5, foie gras mousse, and more. 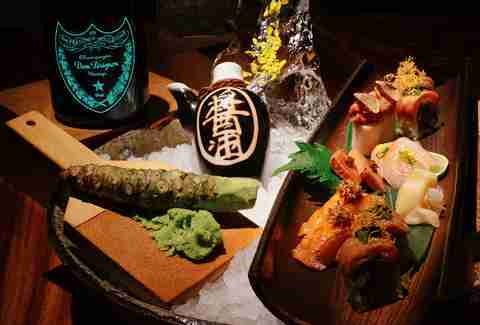 Zuma is ringing in 2019 with a choice of two omakase menus paired with Dom Perignon. The chef's tasting menu is 12-15 dishes, including fun stuff like A5 Japanese Wagyu and black truffle toro tartar. The premium menu is a smaller selection of favorites like the grilled tiger prawn and pickled plum scallop. Hide behind a mask at four very different masquerade balls around town. Andiron at Downtown Summerlin has a $105 multi-course dinner to match its masquerade theme, Gold Spike & Inspire are teaming up for two downtown open-bar parties with one $65 ticket and a Champagne toast at midnight, and Hyde Bellagio will host a "Lakeside Masquerade" with fountain views, starting at $100 (or $175 with hosted bar). Need a few more ideas? You can't go wrong with a great view of the Strip. 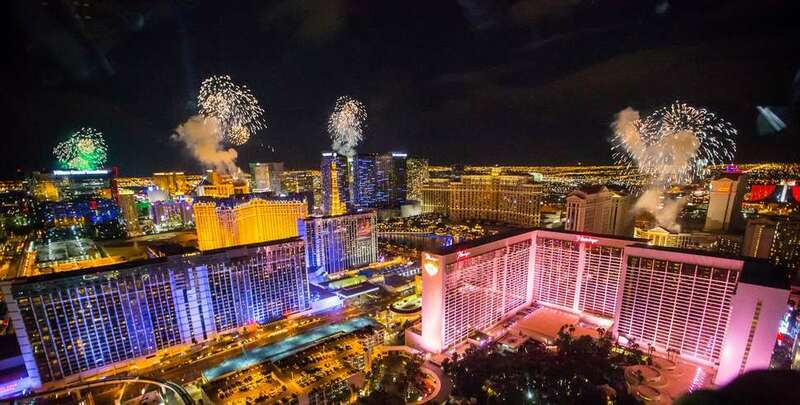 Some of the highest and most spectacular spots for watching the fireworks include Skyfall Lounge at the top of the Delano (beginning at $195), Foundation Room on the 63rd floor of Mandalay Bay ($150 general admission, open bar 9-11pm), the High Roller observation wheel at The LINQ ($500 "All-In" package includes pre-party with open bar and catering plus a bartender in your cabin), Apex Social Club at the Palms ($150, open bar 9-11pm, music by DJ Shift), and VooDoo Lounge on the 50th floor of the Rio (beginning at $100). 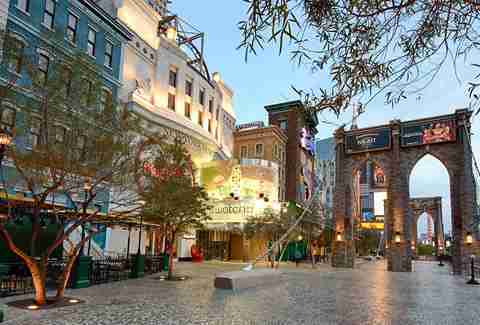 Rob Kachelriess has been writing about Las Vegas for Thrillist for five years. His work has also appeared in Travel + Leisure, Leafly, Supercall, Modern Luxury, and Luxury Estates International's seasonal publication. His New Year's resolution is to finally learn how to spell hors d'oeuvres on the first try. Follow him on Twitter @rkachelries.